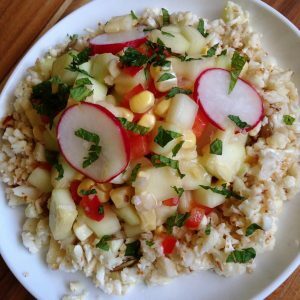 prepare the pilaf by chopping the cauliflower until it resembles rice, transfer to a medium bowl and add pumpkin seeds, almonds, juice of 1 lime, olive oil, .5 teaspoon chipotle powder, salt and pepper. stir to combine and set aside while you prepare the ceviche. for the ceviche, place all the chopped veggies in a large bowl. pour the lime juice on top, add the mustard and agave. toss with your hands to combine. allow to sit for about 10 minutes, tossing it up here and there. after about 10 minutes, drain most of the juice, reserving about 1-2 tablespoons. toss the remaining veggies and lime juice with the olive oil and season to taste.